Huskies came together again this year at the Community Government Association’s annual Big Event! With more than 2,000 student volunteers tackling more than 225 job sites throughout the town of Bloomsburg. Making The Big Event, well B-I-G in more ways than one! Among the locations served were The First Presbyterian Church, Children’s Museum, Kocher Park and more than 100 local residences. 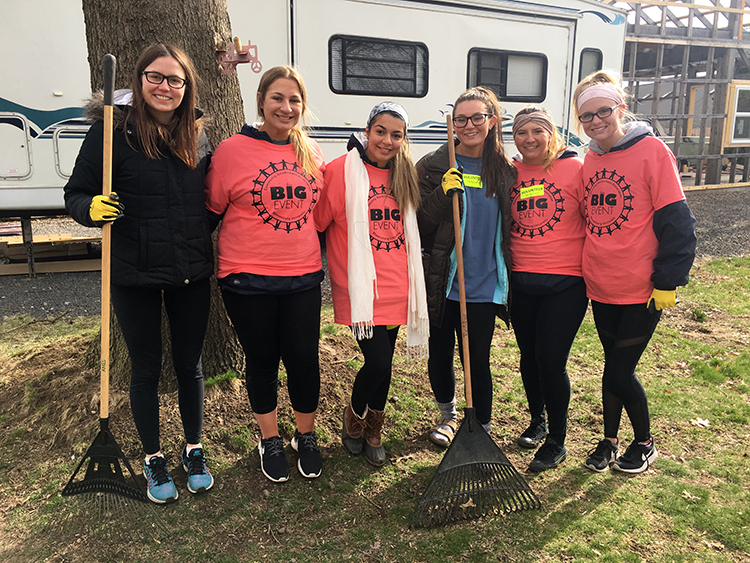 Student volunteers tackled a host of chores such as raking, gardening, mulching, removing debris, digging and various spring-cleaning duties. Sponsored by the CGA, the single-day community service event gives students the opportunity to say “thank you" to Bloomsburg area residents and show appreciation for the community they live, learn and work in. CGA works hard each year to ensure that the LARGEST student-run community service project on campus continues to grow each year. They coordinate this one day event by combining campus, town and student officials and volunteers focusing on aspects, such as town recruitment, fundraising, transportation and student life. Let's make this Big Event the best one yet! Your donation can assist in covering the cost of equipment, t-shirts, supplies and related items needed to carry out the event. You can donate by clicking here! "Last year, 2017 the group I had helped me move a very large compost to a raised bed, It was not easy, They were focused on me not lifting a finger to help them, and as you can see they made progress!